Ovarian cancer forms metastases throughout the peritoneal cavity. 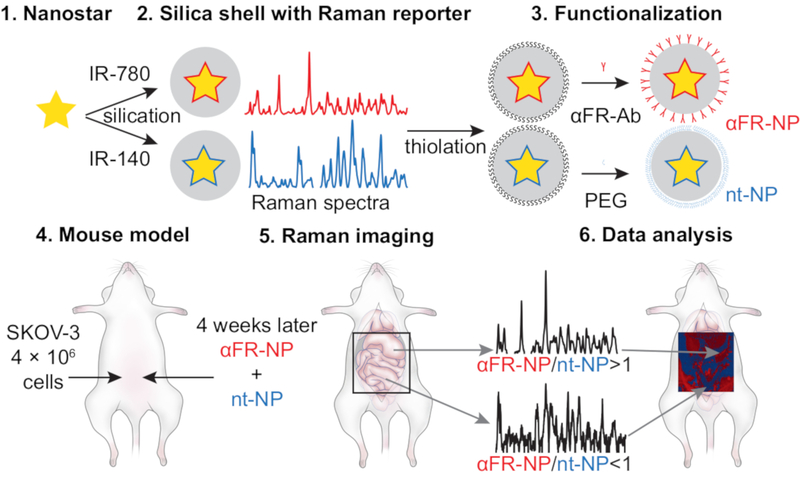 Here, we present a protocol to make and use folate-receptor targeted surface-enhanced resonance Raman scattering nanoprobes that reveal these lesions with high specificity via ratiometric imaging. The nanoprobes are administered intraperitoneally to living mice, and the derived images correlate well with histology. Andreou, C., Oseledchyk, A., Nicolson, F., Berisha, N., Pal, S., Kircher, M. F. Surface-enhanced Resonance Raman Scattering Nanoprobe Ratiometry for Detecting Microscopic Ovarian Cancer via Folate Receptor Targeting. J. Vis. Exp. (145), e58389, doi:10.3791/58389 (2019). Ovarian cancer represents the deadliest gynecologic malignancy. Most patients present at an advanced stage (FIGO stage III or IV), when local metastatic spread has already occurred. However, ovarian cancer has a unique pattern of metastatic spread, in that tumor implants are initially contained within the peritoneal cavity. This feature could enable, in principle, the complete resection of tumor implants with curative intent. Many of these metastatic lesions are microscopic, making them hard to identify and treat. Neutralizing such micrometastases is believed to be a major goal towards eliminating tumor recurrence and achieving long-term survival. Raman imaging with surface enhanced resonance Raman scattering nanoprobes can be used to delineate microscopic tumors with high sensitivity, due to their bright and bioorthogonal spectral signatures. Here, we describe the synthesis of two 'flavors' of such nanoprobes: an antibody-functionalized one that targets the folate receptor — overexpressed in many ovarian cancers — and a non-targeted control nanoprobe, with distinct spectra. The nanoprobes are co-administered intraperitoneally to mouse models of metastatic human ovarian adenocarcinoma. All animal studies were approved by the Institutional Animal Care and Use Committee of Memorial Sloan Kettering Cancer Center. The peritoneal cavity of the animals is surgically exposed, washed, and scanned with a Raman microphotospectrometer. 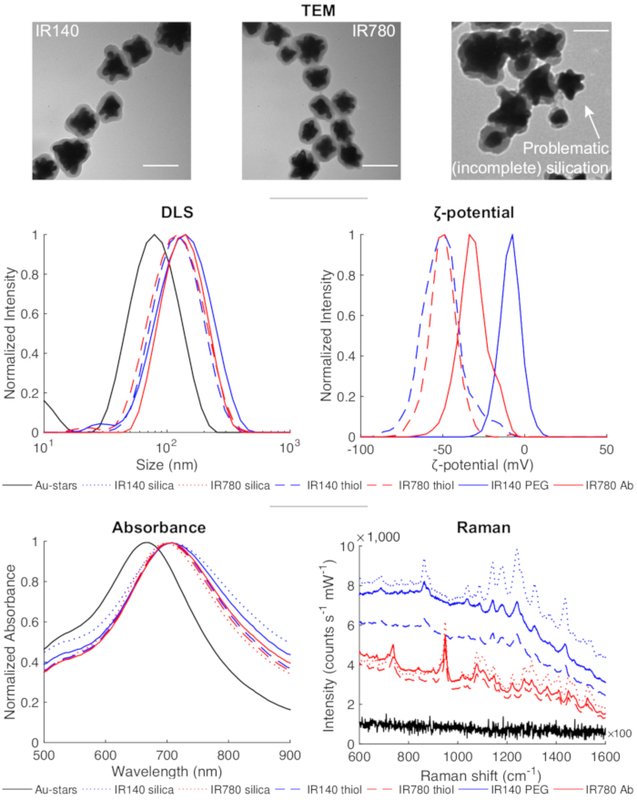 Subsequently, the Raman signatures of the two nanoprobes are decoupled using a Classical Least Squares fitting algorithm, and their respective scores divided to provide a ratiometric signal of folate-targeted over untargeted probes. In this way, microscopic metastases are visualized with high specificity. The main benefit of this approach is that the local application into the peritoneal cavity — which can be done conveniently during the surgical procedure — can tag tumors without subjecting the patient to systemic nanoparticle exposure. False positive signals stemming from non-specific binding of the nanoprobes onto visceral surfaces can be eliminated by following a ratiometric approach where targeted and non-targeted nanoprobes with distinct Raman signatures are applied as a mixture. The procedure is currently still limited by the lack of a commercial wide-field Raman imaging camera system, which once available will allow for the application of this technique in the operating theater. 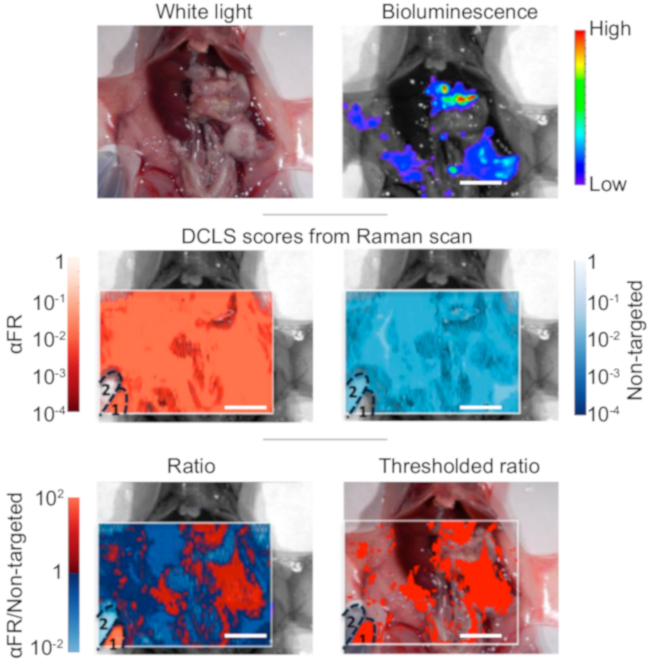 Raman imaging with 'surface enhanced Raman scattering' (SERS) nanoparticles has shown great promise in delineating lesions in a variety of settings and for many different tumor types1,2,3,4. The main advantage of SERS nanoparticles is their fingerprint-like spectral signature, affording them unquestionable detection that is not confounded by biological background signals5. Additionally, the intensity of the emitted signal is further amplified with the use of reporter molecules (dyes) with absorbance maxima in line with the excitation laser, giving rise to 'surface enhanced resonance Raman scattering' (SERRS) nanoparticles with even greater sensitivity6,7,8,9,10,11,12. One barrier that needs to be addressed for the adoption of SE(R)RS nanoparticles13 and many other nanoparticle constructs14,15 for clinical use is their mode of administration, as intravenous injection causes systemic exposure of the agent, and necessitates extensive testing to exclude potential adverse effects. In this article, we present a different paradigm based on the application of nanoparticles locally in vivo, directly into the peritoneal cavity during surgery, followed by a washing step to remove any unbound nanoparticles1. This approach is in line with novel therapeutic approaches that are currently under investigation that also make use of local instillation of agents into the peritoneal cavity, called hyperthermic intraperitoneal chemotherapy (HIPEC). Thus, the principle itself should be relatively easy to integrate into a clinical workflow. We have studied the biodistribution of the nanoparticles after intraperitoneal application, and have not observed any detectable absorption into the systemic circulation1. Additionally, the local application approach circumvents the sequestration of nanoparticles by the reticuloendothelial system, so the numbers of nanoparticles required are markedly reduced. However, when applied topically, antibody-functionalized nanoparticles tend to adhere onto the visceral surfaces even in the absence of their target. In order to minimize false positive signals due to non-specific nanoparticle adhesion, we pursue a ratiometric approach, where a molecularly targeted nanoprobe provides the specific signal, and a non-targeted control nanoprobe, with different Raman spectrum, accounts for non-specific background16,17. We have demonstrated this methodology of topically applied surface enhanced resonance Raman ratiometric spectroscopy recently in a mouse model of diffuse ovarian cancer1. The overall goal of this method is to develop two SERRS nanoprobes, one targeted and one non-specific, to be applied locally in mouse models, in order to image the prevalence/overexpression of a cancer related biomarker using ratiometric detection of the two probes via Raman imaging. In this work, the folate receptor (FR) was chosen as the target, as this is a marker upregulated in many ovarian cancers18,19. Raman microimaging with SERS-based nanoparticles has also been demonstrated for cancer cell identification20. Two distinct "flavors" of Raman nanoparticles are synthesized, each deriving its fingerprint from a different organic dye. The nanoparticles consist of a star-shaped gold core surrounded by a silica shell and demonstrate surface plasmon resonance at approximately 710 nm. The Raman reporter (organic dye) is deposited concurrently with the formation of silica shell. Finally, for the FR-targeted nanoprobes (αFR-NPs) the silica shell is conjugated with antibodies, whereas the non-targeted nanoprobes (nt-NPs) are passivated with a monolayer of polyethylene glycol (PEG). This technique was successfully used to map microscopic tumors in a mouse xenograft model of diffuse metastatic ovarian cancer (SKOV-3), demonstrating its applicability for in vivo use. It can also be extended for use in excised tissues, for tumor phenotyping, or margin determination after debulking as shown in a cognate study21. SERRS nanoprobes provide a robust platform for the creation of multiple targeted tags for biomarkers, synthesized with straightforward chemical reactions as outlined schematically in Figure 1. Here, we present the protocol for the synthesis of the two types of SERRS nanoprobes (sections 1-3), the development of a suitable ovarian cancer mouse model (section 4), the administration of nanoprobes and imaging (section 5), and finally the data analysis and visualization (section 6). All animal studies were approved by the Institutional Animal Care and Use Committee of Memorial Sloan Kettering Cancer Center (#06-07-011). NOTE: Gold nanostars are used as cores for both flavors of SERRS nanoprobes used in this experiment. Prepare 800 mL of 60 mM ascorbic acid (C6H8O6) solution in deionized (DI) water and 8 mL of 20 mM tetrachloroauric acid (HAuCl4) solution in DI water. Cool to 4 °C. Perform this reaction step at 4 °C. Place a conical flask containing 800 mL of the ascorbic acid solution on a magnetic stir plate and induce a steady vortex. Quickly add 8 mL of the tetrachloroauric acid solution into the vortex. Within seconds, nanostars will form and the solution will assume a dark blue color. In case the color at any time becomes pink or purple, signifying the formation of nanospheres, the suspension should be discarded and the synthesis reattempted. Pour the nanostar suspension into 50 mL conical tubes, and centrifuge for 20 min (4 °C, 3,220 x g). Aspirate the supernatant leaving approximate 200 µL of the solution in each tube. Pay caution not to disturb the pellet of nanoparticles at the bottom of the tube. NOTE: The supernatant should have a blue tint because of remaining suspended nanostars. Using a micropipette, agitate the solution to suspend and collect the nanoparticles from each tube. Part of the pellet may be compacted on the bottom of the tube and will not resuspend even with vigorous pipetting-discard this part. Transfer the nanoparticle suspension to a dialysis cassette (MWCO 3.5 kDa) and dialyze at least three days against 2 L of DI water, changing the water daily. Store nanostars in dialysis at 4 °C for up to a month with water changes every 3-4 days. NOTE: The nanostars should be kept in dialysis until required for the silication reaction, as described in section 2. NOTE: Two flavors of Raman nanoprobes are synthesized. The synthesis procedure is the same for both, with the only difference being the Raman reporter molecule (dye) used. In this experiment, IR780 perchlorate and IR140 are used. The reaction should always be performed in plastic containers. The synthesis is highly scalable and can be adjusted for the desired amount of injectate required. Here, a medium batch synthesis is described, which can be scaled linearly to lower or higher volumes as needed, with the same concentrations and reaction times. The reactions for the two SERRS nanoprobe types can be performed in parallel. Pay attention to avoid cross-contamination. Sonication should be performed for the redispersion of nanoparticle pellets after centrifugation during washing steps, or after the nanoparticles were stored for longer than one hour. Sonication should be performed until the nanoparticles are clearly suspended into the solution, typically for 1 s.
In Tube A (a 50 mL conical tube), mix 10 mL of isopropanol, 500 µL of TEOS, 200 µL of DI water, and 60 µL of dye (IR780 perchlorate or IR140, 20 mM in DMF (dimethylformamide)). In Tube B (15 mL conical tube), mix 3 mL of ethanol and 200 µL of ammonium hydroxide. Sonicate the nanostars from Step 1.4 to disperse any clusters in solution and add 1.2 mL of nanostars to the tube. NOTE: the ammonium hydroxide solution is highly volatile and hard to pipette accurately. Store it at 4 °C, until needed, to facilitate pipetting. Place Tube A on a vortex mixer and induce a steady vortex. Rapidly add the contents of Tube B into the vortex and keep mixing for about 5 s. Immediately transfer to a shaker and let react for 15 min while shaking at 300 rpm, at room temperature. After the 15 min incubation, quench the reaction by adding ethanol to fill the 50 mL tube. Centrifuge for 20 min at 3,220 x g and 4 °C. Aspirate the supernatant, leaving about 0.5 mL of solution, being careful not to disturb the pellet. Add 1 mL of ethanol and agitate with a pipette to resuspend the nanoparticles. Transfer to a 1.5 mL centrifuge tube and wash 4 times with ethanol by centrifuging at 11,000 x g for 4 min, aspirating the supernatant, and resuspending the pellet by ultrasonication for approximately 1 s.
NOTE: At this stage, the silicated nanoparticles can be functionalized, as described in section 3, or resuspended in DI water with an extra washing step, for storage at 4 °C for up to a week. NOTE: IR780 SERRS nanoprobes will be conjugated with folate receptor-targeting antibodies via a PEG crosslinker to form αFR-NPs; IR140 SERRS control nanoprobes will be conjugated with a passivating PEG monolayer, for nt-NPs. Both flavors are formed via a thiol-maleimide reaction in separate but parallel reactions. Wash nanoparticles twice by centrifuging at 11,000 x g for 4 min, aspirating the supernatant, and resuspending the pellet in 1 mL of ethanol by ultrasonication. Repeat the washing step once more, but redisperse in 1 mL of 85% ethanol, 10% 3-MPTMS (3-mercaptopropyltrimethoxysilane), and 5% DI water. Incubate at room temperature for 1-2 h to introduce thiols on the particle surface. Wash the thiol-functionalized nanoparticles by centrifuging at 11,000 x g for 4 min, aspirating the supernatant and resuspending the pellet by ultrasonication, twice in ethanol, twice in DI, and finally in HEPES (4-(2-hydroxyethyl)-1-piperazineethanesulfonic acid) buffer (10 mM, pH 7.1), and set aside. NOTE: MES (2-(N-morpholino)ethanesulfonic acid) buffer or HEPES should be used. Buffers with higher salinity, such as PBS (phosphate-buffered saline), may induce nanoparticle aggregation. For the antibody functionalized αFR-NPs, react 200 µg of antibodies (anti-folate binding protein antibody clone [LK26]) with tenfold molar excess of PEG crosslinker (poly(ethylene glycol)(N-hydroxysuccinimide 5-pentanoate) ether N′-(3-maleimidopropionyl) aminoethane (CAS: 851040-94-3), in dimethyl sulfoxide (DMSO)) in 500 µL of MES buffer (10 mM, pH 7.1) for 30 min. Remove excess crosslinker and concentrate antibody by centrifuging the antibody-PEG solution in a centrifugal filter (MWCO 100 kDa). For the centrifugal filters used in this study, perform centrifugation for 10 min at 14,000 x g and 23 °C. Recover the conjugated antibodies in a fresh tube by inverting the filter and centrifuging at 1,000 x g for 2 min. Pipette the IR780 nanoparticles from Step 3.2 into the tube with the antibodies and agitate with the pipette to mix. Incubate the mixture for at least 30 min at room temperature, or, alternatively at 4 °C overnight to form the αFR-NPs. To form nt-NPs, add 1% w/v methoxy-terminated (m)PEG5000-maleimide (CAS: 99126-64-4) dissolved in DMSO to the IR140 SERRS nanoparticles from Step 3.2 and let react in 500 µL MES buffer (10 mM, pH 7.1) for at least 30 min at room temperature, or, alternatively at 4 °C overnight. For administration to mice (section 5), spin down both nanoprobe flavors at 11,000 x g for 4 min, aspirate the supernatant to remove solution with free unreacted antibodies/PEG, and redisperse each flavor in MES buffer (10 mM, pH 7.1) at 600 pM concentration. When resuspending the nanoparticles, minimize unnecessary exposure to the ultrasound, to prevent denaturation of the antibody. Establish a steady culture of human ovarian adenocarcinoma (SKOV-3) cell line. Optionally, to enable monitoring via bioluminescence/fluorescence, use transfected SKOV-3 Luc+/GFP+ cells. Culture cells in RPMI (Roswell Park Memorial Institute) medium with 10% fetal calf serum and passage twice a week. For injection, incubate cells with 0.25% trypsin/0.05% EDTA for 3 min to detach, and subsequently wash and resuspend in PBS at 2 x 106 cells/100 µL. To establish the ovarian micrometastasis model, inject 200 µL of suspended SKOV-3 cells intraperitoneally into athymic female mice (FOXn1nu/FOXn1nu mice, 6-8 weeks old). Disseminated peritoneal spread will occur in approximately 4 weeks. If using SKOV-3 Luc+ cells, tumor growth can be monitored with bioluminescence by administering 2 mg of beetle luciferin in 50 µL PBS via retroorbital injection. Prepare nanoprobes (αFR-NPs and nt-NPs) as described in sections 1-3 and mix at a 1:1 ratio, for a final concentration of 300 pM of each type in MES buffer (10 mM, pH 7.1). Optionally, prepare reference standards of 30 pM of each of the nanoprobe flavors in small (100 µL) conical tubes. Inject intraperitoneally 1 mL of the nanoparticle suspension in each mouse and gently massage the belly to distribute the nanoparticles within the peritoneal cavity. Return the mouse to its housing. After 25 or more minutes, euthanize the mouse via CO2 asphyxiation. Fasten the mouse on a surgical platform, at the supine position (for whole abdomen imaging, the platform needs to be mountable onto the upright microscope stage). Using serrated forceps and dissection scissors, remove the skin to expose the peritoneum and perform a large sagittal incision (between 2 and 3 cm in length) to expose the whole abdomen. Attach the peritoneal flaps onto the platform. Wash the inside of the peritoneal cavity with at least 60 mL of PBS using a plastic squirt bottle. NOTE: To enable unobstructed imaging of the whole abdomen, the intestines need to be mobilized or excised. For excision, resect with a ligation of the mesenteric vessels in order to reduce hemorrhage into the abdominal cavity. Alternatively, to image specific organs, excise them after the PBS wash, and place them onto a microscope slide. Transfer the platform or slide to a Raman microspectrophotometer with upright optical configuration and a motorized stage for imaging; use a commercial system with a 300 mW 785 nm diode laser, with a grating of 1,200 grooves per mm, centered at 1,115 cm-1. Focus on the area of interest using white light optics, parfocal with the Raman laser. Select the area to be imaged and the desired resolution; in this report a high-speed acquisition mode was used (spectra acquired under continuous laser illumination with the microscope stage constantly moving, with effective spatial resolution 14.2 µm by 200 µm; at 5x magnification, 100 mW power at objective, and <100 ms exposure per point). NOTE: The tubes with the reference nanoprobes from Step 5.1 can be placed within the imaged area if desired, to provide internal reference standards for the subsequent analysis. Make sure no extraneous light sources other than the laser reach the objective. Optionally, prepare the sample for histological processing and validation by fixation in 4% paraformaldehyde in PBS overnight at 4 °C. Rinse with PBS at 4 °C for 15 min at least twice. Keep the sample in 70% ethanol in water until standard histological processing and paraffin embedding. For histological validation of the tumors, sections (5 µm thick) from different depths of the paraffin block can be stained with hematoxylin and eosin (H&E). NOTE: All data processing was performed with a graphical user interface developed in-house, using commercial software. All of the functions used have generic equivalents available in other computing environments. Obtain reference spectra for the two flavors, by interrogating pure suspensions of each. The reference spectra can be derived from point scans of the nanoprobes, imaging of the nanoprobes in well-plates, or by including internal references in the experimental scans in the reference tubes (see Step 5.1). Preprocess the reference spectra, by using baseline subtraction (Whittaker filter, λ = 200), normalization by the area under the curve, and Savitzky-Golay derivative filter (second-degree polynomial fit, first-order derivative, width = 15 steps). These preprocessed spectra will serve as references for the classical least squares (CLS) model. Preprocess the sample data from the image in the same way as the reference spectra. Obtain CLS scores for each sample point by using an available CLS algorithm. The direct CLS (DCLS) scores are simply the coordinates of the projection of a sample spectrum onto the linear space defined by the generalized inverse matrix (Moore-Penrose inverse) of the reference spectra. Other fitting algorithms can be used (non-negative least squares, partial least squares, or others). NOTE: Some fitting algorithms can give rise to negative scores, which in this context are not physical. If this is the case, a threshold could be set to exclude negative scores, or a constrained non-negative least squares algorithm be employed instead. The ratio R is best displayed in a diverging color scale centered at zero, to express the relative abundance of the probes in orders of magnitude. The resulting image can be overlaid onto the white light image of the sample, to reveal areas of folate receptor overexpression. For quality control purposes, the nanoparticles can be characterized using a variety of methods during the synthesis process, including TEM, DLS, nanoparticle tracking analysis, and UV/Vis absorbance spectroscopy, as shown in Figure 2. In this way, the size of the gold nanostar core (described in section 1), the formation of the silica shell (section 2) and subsequent surface functionalization (section 3) can be verified (Figure 2). Typically, the size (hydrodynamic diameter) of the gold nanostar core is expected to be around 80 nm, and the silica shell is around 20 nm thick, making the total silicated nanoparticle size around 120 nm and around 140 nm after conjugation with the αFR-antibody. UV/Vis absorbance can also be used to verify the morphology of the nanoparticles. Nanostar cores in water typically have an absorbance maximum at 670 nm, whereas after silication the maximum shifts to around 710 nm. Absorbance maxima at lower wavelengths are a sign of either spherical morphology or aggregation. Typical reaction yields and concentrations are shown in Table 1 and depend strongly on pipetting technique during the wash steps. Each point obtained from the Raman scan contains a spectrum for an interrogated location. These spectra are a linear superposition of the nanoprobes' SERRS signal and any background fluorescence. The spectra can be processed to remove the fluorescence and normalized to unit area to compensate for signal strength, prior to applying the CLS model (described in section 6), as shown in Figure 3. 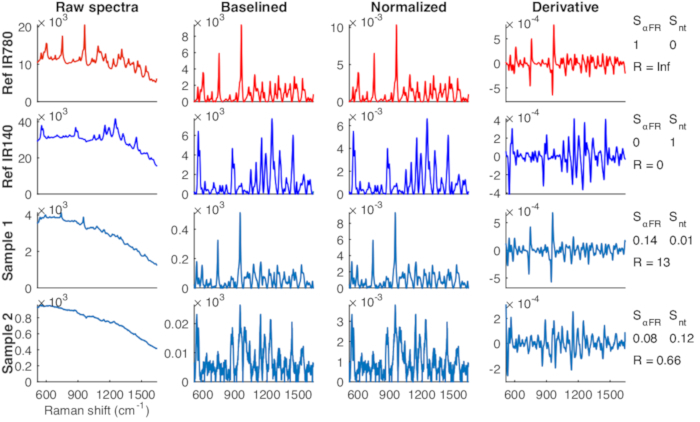 Representative images for scores on each of the nanoprobe reference spectra and their pointwise ratio are shown in Figure 4. Although each score individually does not provide specific localization of tumors, the ratio reveals the presence of disseminated microscopic spread. Table 1: Nanoparticle yield after each reaction step. The concentrations are approximate. The yield was determined by nanoparticle tracking analysis, with two independent syntheses and 5 independent measurements from each. Figure 1: Schematic of synthesis and application of ratiometric SERRS nanoprobe imaging. (1) Gold nanostars are synthesized as described in section 1. (2) A silica shell is formed around the gold nanostar cores and Raman reporter molecules (infrared dyes IR-780 perchlorate and IR-140) are used to create two distinct nanoparticle flavors, as described in section 2. (3) The surface of the nanoparticles is coated with thiols, as described in section 3.1, to enable further surface functionalization. The IR-780 flavor nanoparticles are conjugated with an anti-Folate Receptor antibody, while the IR-140 ones are passivated with a layer of PEG-5k as described in sections 3.3 to 3.6. (4) A mouse model of diffuse intraperitoneal ovarian metastatic spread is developed as described in section 4, and when ready, the SERRS nanoprobes are administered intraperitoneally. (5) The mice are euthanized, and the abdomen surgically exposed to enable Raman imaging as described in section 5. (6) The Raman spectra are analyzed pointwise to determine the relative abundance of the two probes and generate a ratiometric map of folate receptor overexpression as described in section 6. Please click here to view a larger version of this figure. Figure 2: Physical characterization of SERRS nanoprobes. The nanoparticles can be subjected to quality control after each part of the synthesis. Transmission electron microscopy (TEM) reveals the shape of the gold core and the successful formation of the silica shell without nanoparticle aggregation; Scale bar = 100 nm. Dynamic light scattering (DLS) can measure the size and ζ-potential of the nanoparticles to verify successful silication and functionalization. UV/Vis absorbance can be used to confirm the presence of a plasmonic peak around 670 nm for the nanostars, shifting to 710 nm after silication. Raman measurements reveal the presence of the unique spectra of each flavor throughout the synthesis. The intensity of the nanostar spectrum, with no characteristic peaks, was amplified by 100x for emphasis. Please click here to view a larger version of this figure. Figure 3: Processing of Raman spectra. Raw spectra consist of the nanoprobes' SERRS signature, superimposed on top of a wide fluorescence band. With baseline subtraction the fluorescence band is removed, and the Raman peaks become prominent. In order to detect the spectral signature of the nanoparticles irrespective of intensity, each spectrum (references and samples alike) is normalized to unit area. Finally, a smoothing-derivative filter is applied to boost the Raman peaks, while reducing noise. The processed reference spectra are used to develop a CLS model, in order to classify the processed sample spectra based on the ratio R. Please click here to view a larger version of this figure. Figure 4: Ratiometric imaging of ovarian cancer micrometastases in the abdomen. Raman imaging of the exposed abdomen of a mouse, featuring extensive ovarian metastases as revealed by bioluminescence imaging. Each point of the scan features a spectrum, which is processed (section 6, Figure 3) and scored based on a CLS model, to obtain scores on the two references: αFR-NP shown in red, and nt-NP in blue. The scores are then divided pointwise, to reveal the relative abundance of the two probes as a ratio. Optionally, by thresholding the ratio, the "positive" areas can be superimposed onto an optical image of the abdomen, to allow resection or other focused treatments. Figure 4 is an adapted version from reference1, with permission from the journal. Please click here to view a larger version of this figure. The protocol described here provides instruction for the synthesis of two "flavors" of SERRS nanoprobes, and their employment in mice for Raman imaging of ovarian tumor overexpressing the Folate Receptor, using a ratiometric algorithm. The main advantage of Raman imaging over other optical imaging techniques (such as fluorescence) is the high specificity of the nanoprobe signal that cannot be confounded with any signals of biological origin. In this embodiment of Raman imaging, the nanoparticles are not administered intravenously, but locally, via an intraperitoneal injection followed by a single washing step. This methodology, once translated into the clinical arena, would represent an elegant solution to enable surgeons to visualize and therefore resect all ovarian cancer implants, even those that are too small to detect with the naked eye, and which cannot be targeted with a systemically injected imaging agent due to their lack of feeding vessels connected to the systemic circulation. At the same time, as our SERRS nanoparticles are not resorbed into the systemic circulation, potential concerns for side effects are minimized. Our study is one example of the growing evidence that carefully designed nanoconstructs can provide unique advantages over conventional imaging and therapy technologies22,23,24,25,26,27,28,29,30,31,32,33,34,35,36,37,38. The SERRS nanoprobes described here are biologically inert and have been employed for tumor delineation in mouse models of several cancer types. The reaction for the formation of the silica shell (concurrent with reporter dye encapsulation) is an improved version of our previously reported synthesis1,7,8, which is less prone to nanoparticle aggregation and the formation of "free silica" nanoparticles (without gold core). The reaction can be used with a variety of commercially available infrared organic dyes, in addition to the ones presented here, to yield a large collection of Raman flavors. The resulting signal intensity, however, depends on the dye's affinity to gold, and other factors. Additionally, the amount of dye added to the reaction should be determined on a per-dye basis, as certain molecules and their counterions cause aggregation of the gold nanostars more than others. In the case of severe nanoparticle aggregation, the amount of dye used should be decreased. Aggregation of the gold cores is undesirable, as it can cause severe variability in the Raman signal intensity and complicate the acquired data. The formation of free silica is for the most part innocuous, as it provides no Raman signal. However, during functionalization the antibodies will adhere to silica nanoparticles, diminishing the overall targeting effectiveness of the method. The thickness of the silica shell depends on reaction time, temperature, and the amount of water added (Step 2.1). If the resulting silica shell is deemed too thin (Figure 1, top right), one or more of these parameters can be increased appropriately. With regards to data acquisition, its quality greatly depends on the brightness of the nanoprobes. This becomes particularly apparent when performing rapid Raman acquisition, as described in section 5. To make sure that the data is sufficiently discernible from the noise, the spectra should be inspected, and the presence of the representative Raman peaks of the probes verified. If the signal is too weak, the exposure time per point can be increased. However, this approach can lead to prohibitively long scans or very low spatial resolution. To ensure reproducibility and consistency, calibration of the Raman scanner should be performed according to the manufacturer's recommendation and is typically done using a common standard (e.g., a silicon wafer). One of the main strengths of this method is its versatility. Different tumor types can be imaged by using specific antibodies targeting different molecular markers. Additionally, the nanoprobes described here can be administered to animal models — intraperitoneally or intravenously — but also, using the same techniques, they can be used to stain tissues, either fixed or freshly excised. Although the ratiometric technique provides specificity for detection of microscopic tumors, the distribution of the individual probes is not specific to the tumor areas. This means that theranostic techniques such as photothermal/photodynamic therapy or drug-loading would not be ideal, as the therapy would be delivered to healthy areas as well. One potential therapeutic application afforded by this technique would be the automated ablation of microtumors after ratiometric detection. We hope that this local, ratiometric approach of Raman imaging can pave the way for using SERRS nanoprobes, after the necessary clinical trials, as a molecular imaging agent in patients. This method was developed to be compatible with potential future applications in humans, as the nanoparticles could be administered to and removed from the abdominal cavity using devices that are already in clinical use for HIPEC. • M.F.K. is listed as an inventor on several issued or pending patent applications related to this work. M.F.K. is a co-founder of RIO Imaging, Inc., which aims at translating SERRS nanoparticles into the clinics. • The authors declare that they have no other competing financial interests. The following funding sources (to M.F.K.) are acknowledged: NIH R01 EB017748, R01 CA222836 and K08 CA16396; Damon Runyon-Rachleff Innovation Award DRR-29-14, Pershing Square Sohn Prize by the Pershing Square Sohn Cancer Research Alliance, and MSKCC Center for Molecular Imaging & Nanotechnology (CMINT) and Technology Development Grants. Acknowledgments are also extended to the grant-funding support provided by the MSKCC NIH Core Grant (P30-CA008748). Oseledchyk, A., Andreou, C., Wall, M. A., Kircher, M. F. Folate-Targeted Surface-Enhanced Resonance Raman Scattering Nanoprobe Ratiometry for Detection of Microscopic Ovarian Cancer. ACS Nano. 11, (2), 1488-1497 (2017). Andreou, C., et al. Imaging of Liver Tumors Using Surface-Enhanced Raman Scattering Nanoparticles. ACS Nano. 10, (5), 5015-5026 (2016). Karabeber, H., et al. Guiding brain tumor resection using surface-enhanced Raman scattering nanoparticles and a hand-held Raman scanner. ACS Nano. 8, (10), 9755-9766 (2014). Kircher, M. F., et al. A brain tumor molecular imaging strategy using a new triple-modality MRI-photoacoustic-Raman nanoparticle. Nature Medicine. 18, (5), 829-834 (2012). Andreou, C., Kishore, S. A., Kircher, M. F. Surface-Enhanced Raman Spectroscopy: A New Modality for Cancer Imaging. Journal of Nuclear Medicine. 56, (9), 1295-1299 (2015). Harmsen, S., et al. Rational design of a chalcogenopyrylium-based surface-enhanced resonance Raman scattering nanoprobe with attomolar sensitivity. Nature Communications. 6, 6570 (2015). Harmsen, S., et al. Surface-enhanced resonance Raman scattering nanostars for high-precision cancer imaging. Science Translational Medicine. 7, (271), 271ra277 (2015). Harmsen, S., Wall, M. A., Huang, R., Kircher, M. F. Cancer imaging using surface-enhanced resonance Raman scattering nanoparticles. Nature Protocols. 12, (7), 1400-1414 (2017). Huang, R., et al. High Precision Imaging of Microscopic Spread of Glioblastoma with a Targeted Ultrasensitive SERRS Molecular Imaging Probe. Theranostics. 6, (8), 1075-1084 (2016). Iacono, P., Karabeber, H., Kircher, M. F. A "schizophotonic" all-in-one nanoparticle coating for multiplexed SE(R)RS biomedical imaging. Angewandte Chemie, International Edition in English. 53, (44), 11756-11761 (2014). Spaliviero, M., et al. Detection of Lymph Node Metastases with SERRS Nanoparticles. Molecular Imaging and Biology. 18, (5), 677-685 (2016). Nayak, T. R., et al. Tissue factor-specific ultra-bright SERRS nanostars for Raman detection of pulmonary micrometastases. Nanoscale. 9, (3), 1110-1119 (2017). Thakor, A. S., et al. The fate and toxicity of Raman-active silica-gold nanoparticles in mice. Science Translational Medicine. 3, (79), 79ra33 (2011). Liu, J., et al. Effects of Cd-based Quantum Dot Exposure on the Reproduction and Offspring of Kunming Mice over Multiple Generations. Nanotheranostics. 1, (1), 23-37 (2017). Wu, N., et al. The biocompatibility studies of polymer dots on pregnant mice and fetuses. Nanotheranostics. 1, (3), 261-271 (2017). Garai, E., et al. High-sensitivity real-time, ratiometric imaging of surface-enhanced Raman scattering nanoparticles with a clinically translatable Raman endoscope device. Journal of Biomedical Optics. 18, (9), 096008 (2013). Wang, Y. W., et al. Rapid ratiometric biomarker detection with topically applied SERS nanoparticles. Technology (Singap World Sci). 2, (2), 118-132 (2014). Lengyel, E. Ovarian cancer development and metastasis. American Journal of Pathology. 177, (3), 1053-1064 (2010). Vergote, I. B., Marth, C., Coleman, R. L. Role of the folate receptor in ovarian cancer treatment: evidence, mechanism, and clinical implications. Cancer and Metastasis Reviews. 34, (1), 41-52 (2015). Fasolato, C., et al. Folate-based single cell screening using surface enhanced Raman microimaging. Nanoscale. 8, (39), 17304-17313 (2016). Wang, Y. W., et al. Raman-Encoded Molecular Imaging with Topically Applied SERS Nanoparticles for Intraoperative Guidance of Lumpectomy. Cancer Research. 77, (16), 4506-4516 (2017). Andreou, C., Pal, S., Rotter, L., Yang, J., Kircher, M. F. Molecular Imaging in Nanotechnology and Theranostics. Molecular Imaging and Biology. 19, (3), 363-372 (2017). Chitgupi, U., Qin, Y., Lovell, J. F. Targeted Nanomaterials for Phototherapy. Nanotheranostics. 1, (1), 38-58 (2017). Choi, D., et al. Iodinated Echogenic Glycol Chitosan Nanoparticles for X-ray CT/US Dual Imaging of Tumor. Nanotheranostics. 2, (2), 117-127 (2018). Dubey, R. D., et al. Novel Hyaluronic Acid Conjugates for Dual Nuclear Imaging and Therapy in CD44-Expressing Tumors in Mice In Vivo. Nanotheranostics. 1, (1), 59-79 (2017). Gupta, M. K., et al. Recent strategies to design vascular theranostic nanoparticles. Nanotheranostics. 1, (2), 166-177 (2017). Huang, Y. J., Hsu, S. H. TRAIL-functionalized gold nanoparticles selectively trigger apoptosis in polarized macrophages. Nanotheranostics. 1, (3), 326-337 (2017). Pal, S., Harmsen, S., Oseledchyk, A., Hsu, H. T., Kircher, M. F. MUC1 Aptamer Targeted SERS Nanoprobes. Advanced Functional Materials. 27, (32), (2017). Zanganeh, S., et al. Iron oxide nanoparticles inhibit tumour growth by inducing pro-inflammatory macrophage polarization in tumour tissues. Nat Nanotechnol. 11, (11), 986-994 (2016). Lee, J., Lee, Y. M., Kim, J., Kim, W. J. Doxorubicin/Ce6-Loaded Nanoparticle Coated with Polymer via Singlet Oxygen-Sensitive Linker for Photodynamically Assisted Chemotherapy. Nanotheranostics. 1, (2), 196-207 (2017). Li, R., Zheng, K., Yuan, C., Chen, Z., Huang, M. Be Active or Not: the Relative Contribution of Active and Passive Tumor Targeting of Nanomaterials. Nanotheranostics. 1, (4), 346-357 (2017). Lin, S. Y., Huang, R. Y., Liao, W. C., Chuang, C. C., Chang, C. W. Multifunctional PEGylated Albumin/IR780/Iron Oxide Nanocomplexes for Cancer Photothermal Therapy and MR Imaging. Nanotheranostics. 2, (2), 106-116 (2018). Roberts, S., et al. Sonophore-enhanced nanoemulsions for optoacoustic imaging of cancer. Chemical Science (Royal Society of Chemistry: 2010). 9, (25), 5646-5657 (2018). Liu, L., Ruan, Z., Yuan, P., Li, T., Yan, L. Oxygen Self-Sufficient Amphiphilic Polypeptide Nanoparticles Encapsulating BODIPY for Potential Near Infrared Imaging-guided Photodynamic Therapy at Low Energy. Nanotheranostics. 2, (1), 59-69 (2018). Liu, R., Tang, J., Xu, Y., Zhou, Y., Dai, Z. Nano-sized Indocyanine Green J-aggregate as a One-component Theranostic Agent. Nanotheranostics. 1, (4), 430-439 (2017). Sneider, A., VanDyke, D., Paliwal, S., Rai, P. Remotely Triggered Nano-Theranostics For Cancer Applications. Nanotheranostics. 1, (1), 1-22 (2017). Wall, M. A., et al. Surfactant-Free Shape Control of Gold Nanoparticles Enabled by Unified Theoretical Framework of Nanocrystal Synthesis. Advanced Materials. 29, (21), (2017). Sonali,, et al. Nanotheranostics: Emerging Strategies for Early Diagnosis and Therapy of Brain Cancer. Nanotheranostics. 2, (1), 70-86 (2018).